Third and fourth-grade girls recently enjoyed a morning with their moms for their annual mother & daughter retreats. A snow day earlier in February moved the third grade girls retreat to Monday, February 25, and the girls were very excited to have their moms join them on campus for a morning. The retreat began with Mass, during which Fr. Thomas encouraged the girls to trust and listen to their moms. 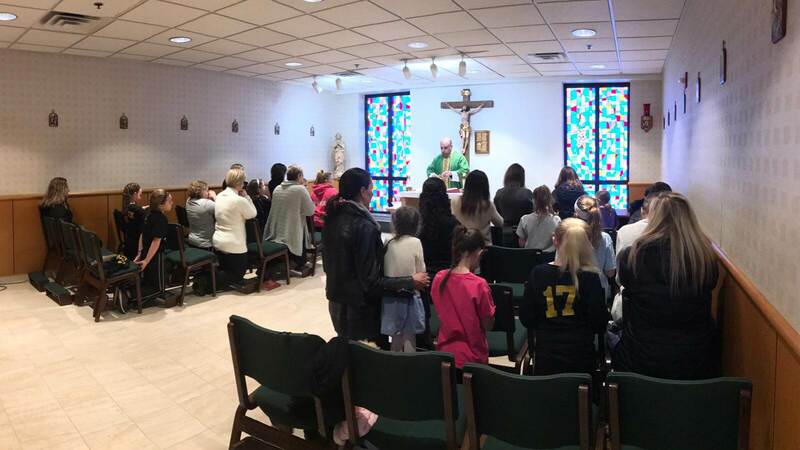 After Mass, the moms stayed in the chapel for a reflection about the role of the Blessed Virgin Mary in the life of a mom – as model and companion – followed by a decade of the rosary to pray for their families and intentions. During this time, the girls made their moms a card and were happy to give it to them when they were reunited for snack and game time. 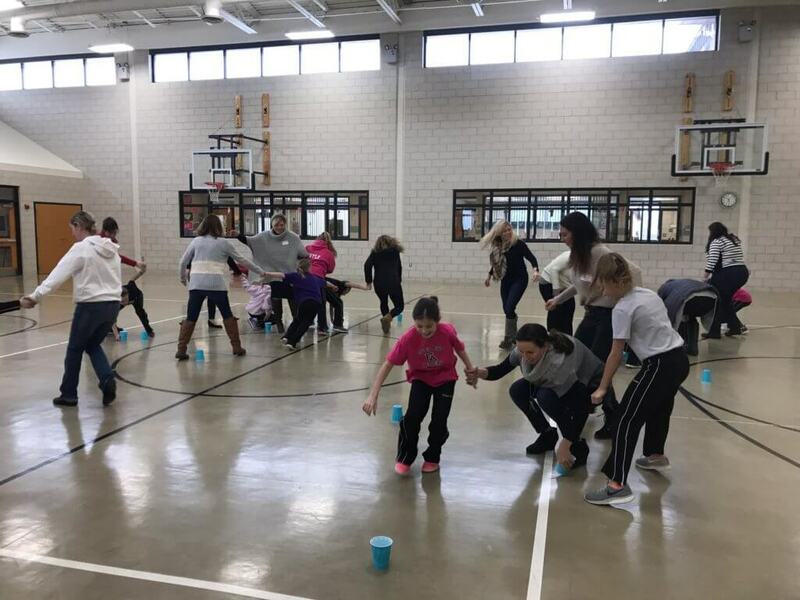 Lots of laughter could be heard as the girls and moms participated in several competitive challenges, including a hula hoop challenge. The morning ended with the girls reciting the poem “I Can” for their moms that they memorized as a class. 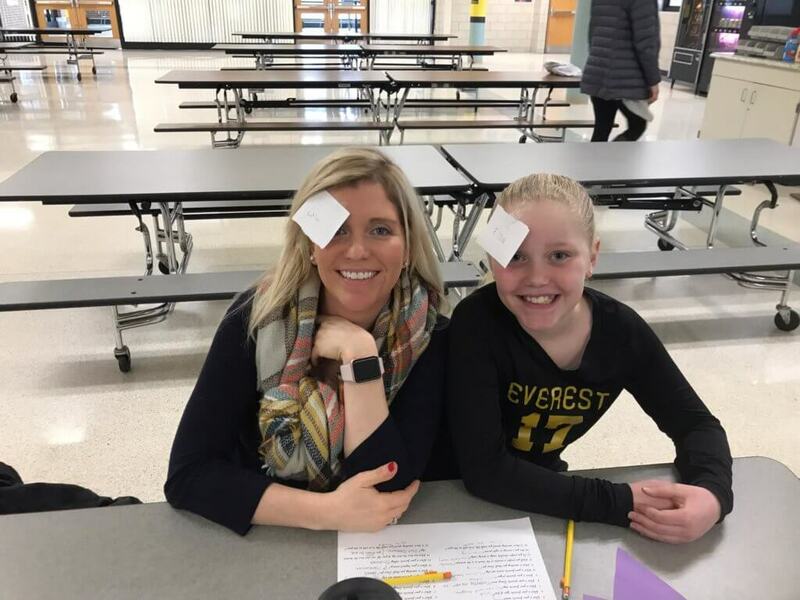 Wednesday, February 27 it was fourth grade girl’s turn. After praying together in Mass, since it was a Spirit Day, the moms got to experience first-hand the monthly academy spirit assembly! Then the moms enjoyed some time in the chapel with a spiritual talk led by Fr. Thomas. The girls were encouraged to write a card to their moms listing “ten things I thank you for”. As they were starting, Elena Neiman exclaimed: “I could write a hundred!” We all could write more than a hundred things we thank our Everest moms for. They do so much for us every single day. After that the girls and moms enjoyed some time together, shared a snack, and played some fun games.